Grogan, L. & Sadanand, A. (2013). Rural electri cation and employment in poor countries: Evidence from Nicaragua. World Development (43) pp. 252-265. Available here. Personal communication, Siana Teelucksingh, Clinton Foundation, June 2016. McElhaney, Kellie A. & Mobasseri, Sanaz. (2012). Women Create a Sustainable Future. UC Berkeley Haas School of Business. Available here. IRENA. (2017). Renewable energy and jobs: Annual Review 2017. Available here. EY. (2016). Women in power and utility index 2015. Available here. USAID. (2016). Engendering Utilities: Improving Gender Diversity in Power Sector Utilities. Available here. IRENA. (2016). Renewable energy and jobs: Annual Review 2016. Available here. Rojas, A., Prebble, M. & Siles, J. (2015). “Flipping the switch: Ensuring the energy sector is sustainable and gender-responsive.” In L. Aguilar, M. Granat, & C. Owren. Roots for the future: The landscape and way forward on gender and climate change. IUCN & GGCA. Available here. Prebble, M., & Rojas, A. (2017). Energizing equality. 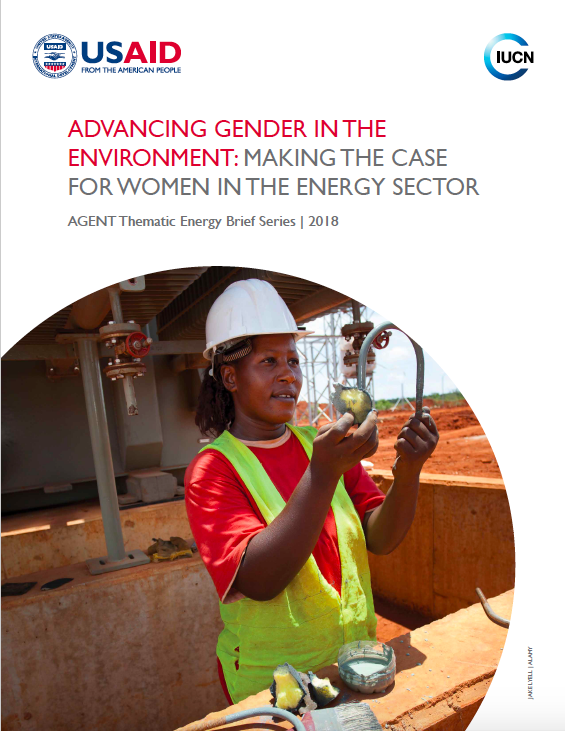 the importance of integrating gender equality principles in national energy policies and frameworks. IUCN Global Gender Office. Available here. European Institute for Gender Equality (EIGE). (2012). Review of the Implementation in the EU of area K of the Beijing Platform for Action: Women and the Environment Gender Equality and Climate Change. European Union. Available here. Rojas, A.V., Siles, J. (2014). Guía sobre Genero y Energia para Capacitadoras(es) y Gestoras(es) de Politicas Publicas y Proyectos. ENERGIA, OLADE and IUCN. Available here. GE Renewable Energy. (2016). “Women brush prejudice aside at Saint-Nazaire.” Blog. Available here. Guarezi, M.H. (2012). Equidad de Genero en la ITAIPU Binacional. Primer Foro Regional de Empresas por la Igualdad. August 28th-29th 2012. Mexico City. Mexico. Arizona State University. (n.d.) Vocational training & education for clean energy (VOCTEC). Brochure. Women in Sustainability, Environment and Renewable Energy (WISER). Winrock International. (n.d.). “Supporting Energy Entrepreneurs Through the Empowered Entrepreneur Training Program. Available here. The Global Alliance for Clean Cookstoves. (2015). Understanding Impacts of Women’s Engagement in the Improved Cookstove Value Chain in Kenya. Available here. Biogas Sector Partnership Nepal (BSP). (2009). Gender mainstreaming in the biogas support programme, Nepal. ENERGIA. Available here.